This is a recipe from a St. Louis based pasta restaurant chain and I have served this many time to rave reviews. 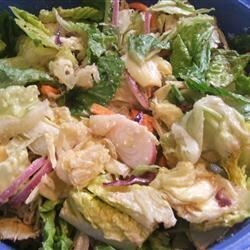 In a large bowl, combine the romaine lettuce, iceberg lettuce, artichoke hearts, red onions and pimentos. Toss together. Prepare the dressing by whisking together the olive oil, red wine vinegar, salt, pepper and cheese. Refrigerate until chilled and pour over salad to coat. Toss and serve.